Wouldn’t you like to jump this queue at the Frankfurt Airport? Here’s how! Traveling with the truly aged has both challenges and benefits. The pace will be slow, but there are advantages that come with age. Look at the body language in the Queue at the Hermitage! This is a vacation? First cardinal rule: Take all the help you can get! Traveling with an elderly companion requires extra alertness, awareness of hazards, and forethought. 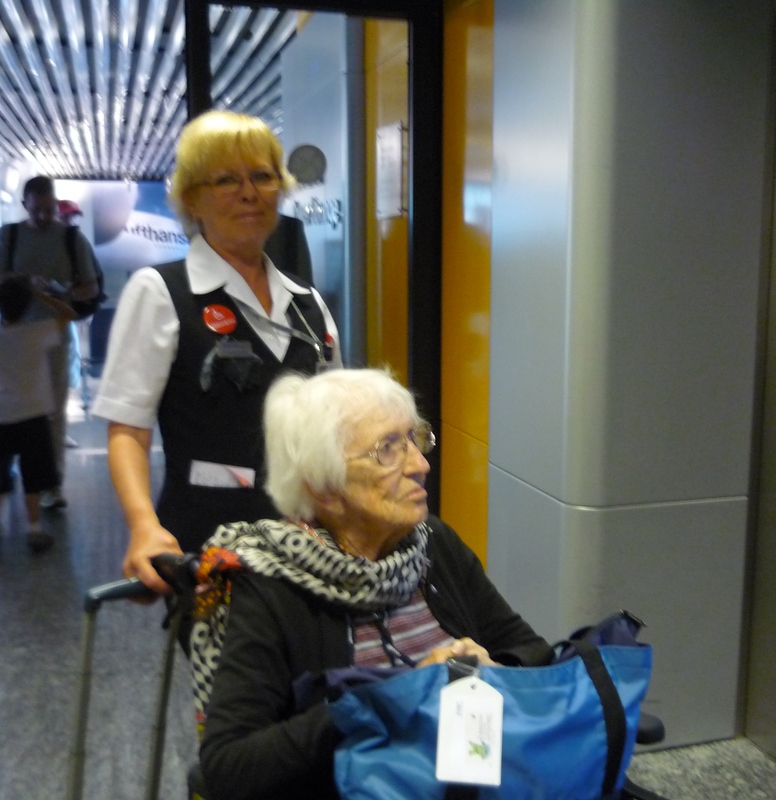 Tour operators and airline personnel have lots of experience on how to make an older person safe and comfortable – don’t hesitate to ask for help and take advantage of their knowledge. If you are flying, be sure to request wheelchair assistance at every airport. Mom objected to using a wheelchair at first – “I’m not THAT old!” but when she realized how many lines she could avoid standing in, and how many short cuts between terminals would be opened, she relaxed and played the queen enthroned with gusto. Many airlines reserve easy-access seats on the airplane for handicapped passengers and their escorts. Mom and I had the benefit of this allowance which twice gave us a trio of seats to share between the two of us in the extra-leg-room section of the plane. Shamelessly use any other perk available. My United Gold card got us into the Star Alliance Lounge in both San Francisco and Frankfurt. 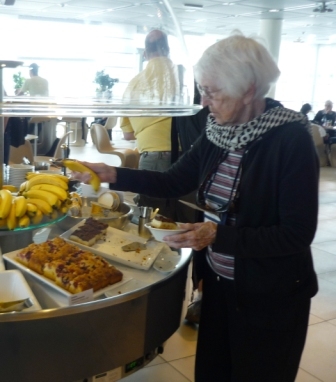 SFO’s United Club enabled us to get through an unexpected 3 hour flight delay without too much pain; in Frankfurt we enjoyed a varied and delicious lunch buffet in the Lufthansa Lounge between flights. Many bus tour companies reserve the front seats of the bus for handicapped passengers. Many bus tour companies offer “kneeling” buses for easier access. Most museums, even in ancient churches and public buildings, have some sort of elevator or ramp access. Don’t shy about asking, as your tour guide may not think of it or may not want to be bothered finding out if the “lift” is currently in operation. If you are part of a tour group, insist that the “sweep” stay with you, even though your pace may be slow. This will prevent your being lost from the group if they make a sudden left turn and you miss it by lagging (as happened to us in Stockholm as we navigated through the labyrinthine City Hall). Schedule some break time for the support team. Walking at a slower-than-normal pace with an arm crooked to offer support can be as exhausting as power-walking, and being constantly alert for hazards and obstacles is wearing on the brain. Let your older companion take a nap and use the time to stretch and exercise your body, move fast, take in a few extra sights and sounds of the exotic place you are in. You’ll feel great – and grateful for all you are able to do. Trust me, your older fellow traveler will be happy to vicariously share any independent adventures over the dinner table. I loved the Hermitage. I was by myself and my many years of riding the NYC subways made quite adept at elbowing my way to the front. Great tips.